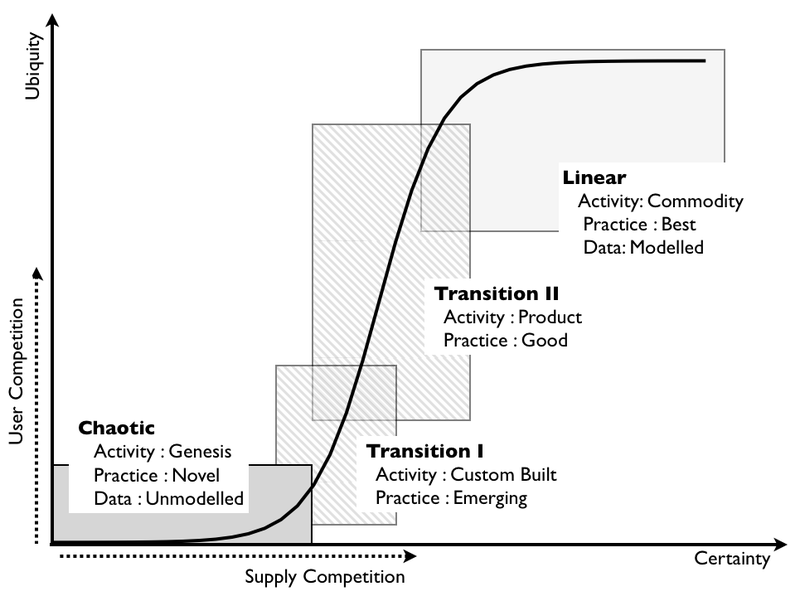 In the previous sections, I’ve mainly concentrated on the evolution of activities in the value chain, however value chains consist of more than this as they also include practices and data. All appear to evolve from chaotic (poorly understood, rare) to more linear (well understood, commonplace) and the data I collected six years ago mapped all three to the same pattern (see figure 15). For activities we have the evolution from genesis to custom-built examples to products (with rental services) to commodity (with utility services). We normally refer to this as commoditisation. For practices we have the evolution from novel to emerging to good to best practice. For data we have the evolution from un-modelled (e.g. we don't know what the structure is and hence we tend to call it unstructured) to modelled (i.e. the data and its structure is understood). Even with scientific pursuits we have an equivalent evolution from concept to hypothesis to theory to universally accepted. It’s important to emphasis that the process of evolution is common to all and can be graphed over the axis of ubiquity vs certainty. The process is also unavoidable because it is driven by user and supply competition i.e. a single actor (e.g. a company) cannot prevent it from happening as it is results from the interaction of all actors in a market. 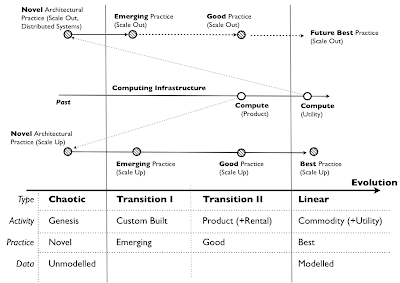 Around 2009, I was also introduced to Dave Snowden’s Cynefin framework that describes the transition of practices from novel to emergent to good to best practice. 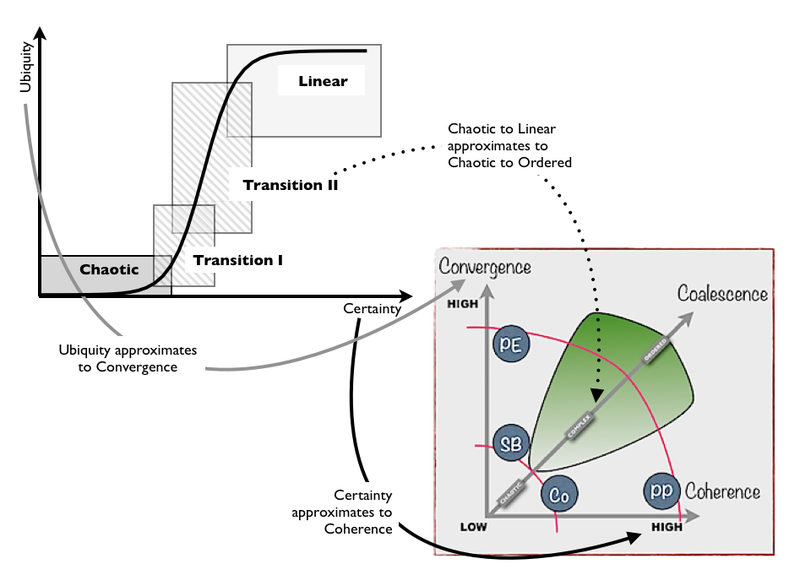 The similarity in pattern appeared extremely close and Snowden’s recent and independent work also appears to be converging on a similar axis (see figure 16) and structure. 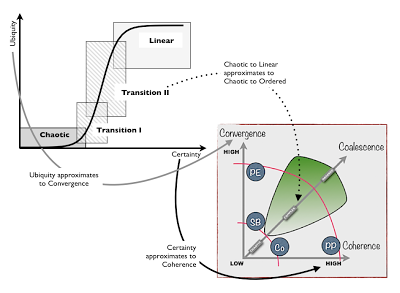 It discusses the shift from chaotic to ordered which is akin to the shift from chaotic to linear. Convergence (in terms of overall group thinking) is similar to ubiquity or how commonplace something is. Coherence is the degree to which any need or requirement is structured, defined and understood which is similar to certainty. Whether these two pieces of work will continue to converge is of great interest to me, because cause, correlation and data is one thing but nothing validates work more than independent discovery of common patterns. Which leads me neatly onto my next topic. Consider the provision of an ordinary window. While a window is a standardized building commodity, the practices used to manufacture them have evolved dramatically from blast furnace and grinding to Pilkington’s float glass method. In other words, the way we make windows (the practice) has evolved but the window (the result of activity) remains roughly the same. Here we have independence of practice and activity. However, in many cases as the activity evolves then the associated practices tend to co-evolve. For example, consider computing infrastructure. When infrastructure was primarily a product, novel architectural practices appeared for capacity planning which relied mostly on the use of more powerful machines (‘scale-up’). For system resilience we also had novel architectural practices that heavily relied on ‘n+1’ designs. Theses architectural practices were based primarily on better products (i.e. hardware) and they diffused and evolved becoming emerging, then good then best practice. However as the activity of computing infrastructure itself evolved to become more of a commodity that is these days provided through utility services (such as Amazon EC2) then novel architectural practices appeared based not upon hardware but on software. For capacity planning we now had the novel practice of ‘scale-out’ (i.e. the use of large numbers of small and good enough virtual machines) that started to diffuse and evolve becoming emerging and then good practice. For resilience, the novel practice of design for failure appeared and also started to diffuse and evolve becoming emerging and then good practice. Hence, as infrastructure has evolved, the practices of infrastructure management have also evolved. This inter-relationship of practice and activity is shown in Figure 17. 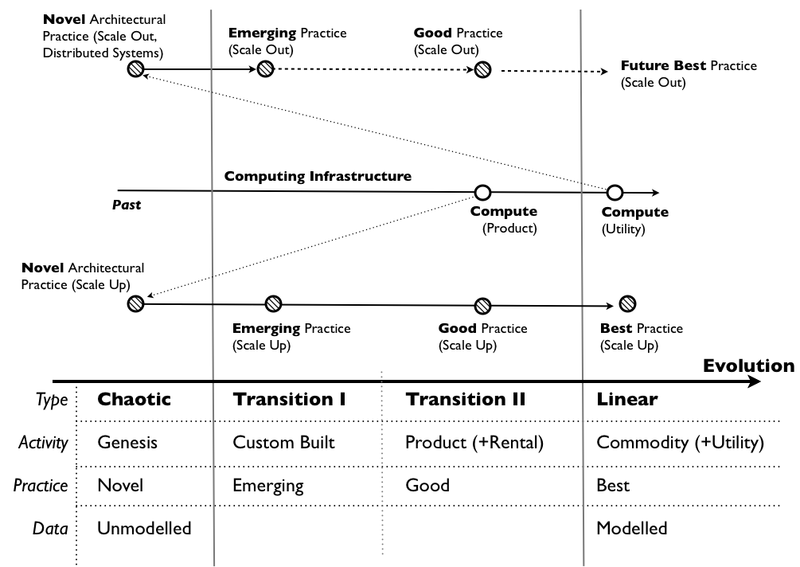 Figure 17 Co-evolution of Practice and Activity. This co-evolution of practice and activity can create significant inertia to change for consumers of that activity. 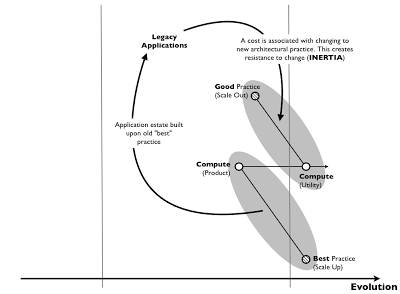 In the case of infrastructure, if the consumers of large powerful servers had developed estates of applications based upon the practices of scale-up and N+1, then as the activity evolved to more utility services those consumers would incur significant costs of re-architecture of the “legacy estate” to the new world. Our current way of operating often creates resistance (or inertia) to change due to the costs of changing practices (see figure 18). In many cases we attempt to circumnavigate this by applying the “old” best practice to the new world or we attempt to persuade the new world to act more like the past. Today, cloud computing is an example of this as it represents an evolution of parts of IT from product to utility services and the “legacy” is often cited as a key issue for adoption or for the creation of services which mimic past models. 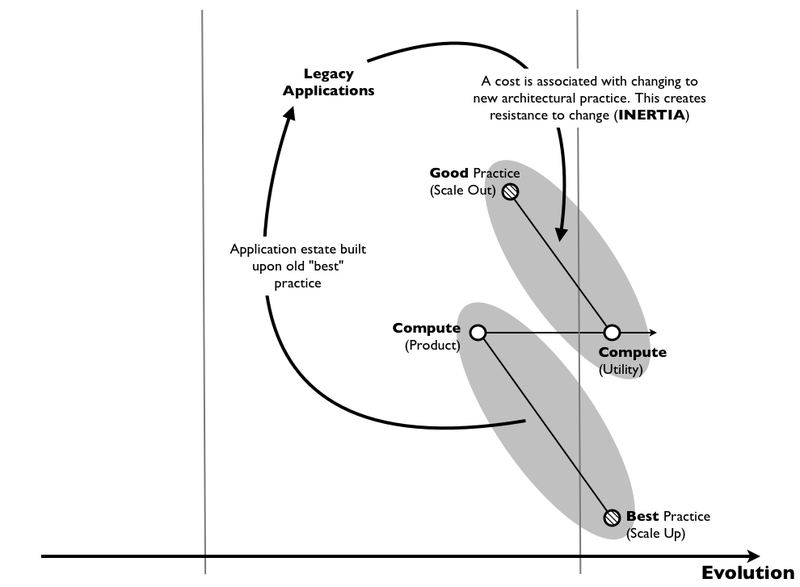 Figure 18 Inertia due to co-evolution of Practice with Activity. Organisations can be described through value chains of activities, practices and data. All the components of that value chain are evolving and sometimes co-evolving. 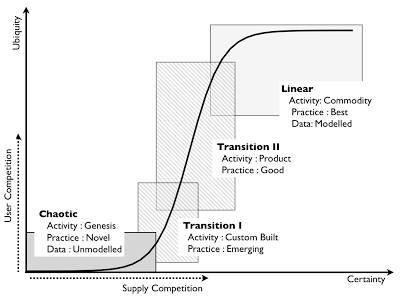 Plotting value chain vs the state of evolution can create a map of this landscape. As those components evolve their characteristics change which is why one size fits all techniques are ineffective. The co-evolution of practice with an activity can create resistance (i.e. inertia) to change due to the costs associated with it. In comfort to the reader, I will now tell you that we are slowly getting to the good stuff and all of this is necessary to understand it. But before we do, we have a few more hurdles, as we need to explore the relationship between genesis and evolution along with macro and micro economic effects. Then we should have enough to start using the map to exploit our position and explain strategy.